Save your search - find out immediately when "Herbert Hoover" is available at auction! Hoover, Herbert (1874-1964) Three Typed Letters Signed, 1925-1927. Hoover, Herbert (1874-1964) Typed Letter Signed, 18 June 1932. Hoover, Herbert (1874-1964) Signed Photograph. Hoover, Herbert (1874-1964) Signed Photo. Hoover, Herbert (1874-1964) Typed Letter Signed, New York, 5 July 1946. 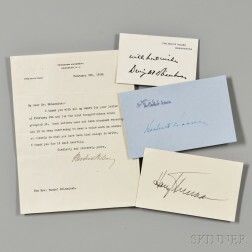 Presidential Signed Material: Wilson, Hoover, Truman, and Eisenhower. Hoover, Herbert (1874-1964) Three Signed Presidential Items and Other Material Signed by Presidential Cabinet Members. 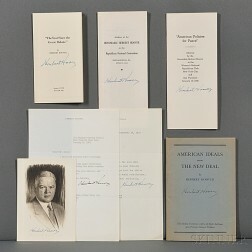 Hoover, Herbert (1874-1964) Four Signed Offprints of Speeches, Signed Portrait, and Two Typed Letters Signed. 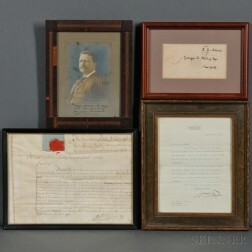 Presidential and Political Autographs 1860s. Harding, Warren G. (1865-1923) Photograph of the Cabinet, Signed by Andrew Mellon (1855-1937).